PanARMENIAN.Net - Armenia and Georgia have agreed to expand trade to $1 billion in the coming years, Prime Minister Nikol Pashinyan told a joint press conference with his Georgian counterpart Mamuka Bakhtadze on Monday, September 10. Bakhtadze arrived in Yerevan on Monday and has already met Pashinyan and President Armen Sarkissian. 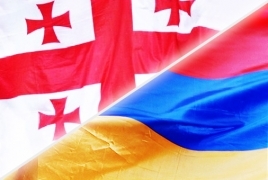 Trade between Armenia and Georgia amounted to $249 million in 2017, up by 4.8% against the previous year.